CHARLOTTE, N.C. (April 9, 2018) – The 600 Festival Association did it again! 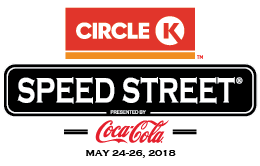 Commemorating the May races at Charlotte Motor Speedway with family-oriented events, the 600 Festival has drummed up Judah & the Lion, Chase Rice, Easton Corbin, Dustin Lynch and Brett Young to perform in uptown Charlotte May 24-26 for the 24th annual Circle K Speed Street presented by Coca-Cola. Tickets go on sale Friday, April 13 and are priced at $15 until May 1, $25 from May 1 to event day, and $35 on the day of the show. Ticket prices are per night. Tickets may be purchased at www.600festival.com. Performing on the Coca-Cola stage at 8:45 p.m. will be one of Nashville’s most genre-bending bands, Judah & the Lion. Released in March 2017, “Folk Hop N Roll” is the group’s second full-length album featuring a new genre of music dubbed “Folk Hop.” The album features RIAA-certified gold single, “Take It All Back,” which topped the Alternative radio charts at No. 1 for three consecutive weeks. Judah & the Lion were recently named iHeart Radio’s Best New Alt/Rock Artist at the 2018 iHeart Radio Music Awards. Charlotte-based bands, Reaves and Jaggermouth, will open for the trio starting at 6:30 p.m.
Georgia native and singer-songwriter, Travis Denning will open for the country music stars starting at 6:30 p.m. Headlining Circle K Speed Street presented by Coca-Cola on Saturday will be 32-year-old country star, Dustin Lynch. The Tennessee native has been on a steady path toward superstardom with five consecutive No. 1s, three top-5 albums, platinum-level certifications and tours with the biggest names in country music. One of RollingStone.com’s Most Anticipated Albums of 2017, his latest album “CURRENT MOOD” features chart-rising single “I’d Be Jealous Too,” No. 1 hit “Seein’ Red” and the record-setting “Small Town Boy,” which reigned the Billboard Country Airplay chart for four straight weeks in 2017, making it the chart’s longest-running leader of the year with the largest single-week audience. It earned Lynch his first iHeartRadio Music Awards nomination for Country Song of the Year. With his honest lyrics and West Coast-meets-Southern sound, special guest Brett Young will capture the hearts of guests starting at 8 p.m. The newly-named 2018 ACM New Male Vocalist of the Year’s self-titled, gold-certified debut album features three platinum-certified No. 1 singles, “Like I Loved You,” “Sleep Without You,” and “In Case You Didn’t Know.” His current single, “Mercy,” is steadily climbing the charts and quickly hit No. 1 in its second week on the Vevo Top Country chart. These concerts will take place in Romare Bearden Park all three nights. From noon to 8 p.m. each day on Tryon Street, all other Circle K Speed Street presented by Coca-Cola’s activities remain free to the public including access to racing’s brightest stars, musical entertainment, a variety of food and beverage vendors, a kids’ zone, and interactive displays from sponsors including Circle K, Coca-Cola, GEICO, North Carolina Education Lottery, PNC Bank, Vacation Village Resorts, HARIBO Gummy Candy, Swisher Sweets and more. In addition, fans can enjoy these family-friendly events in May including Movies on the Campus in conjunction with Jiggy with the Piggy in Kannapolis on May 4; the Zucchini 600 in Kannapolis May 5; Haulers on Union Parade and Fan Fest presented by Freightliner in Concord May 17; and the Little 600 at GoPro Motorplex in Mooresville May 22. The event has been promoted and produced exclusively by CSM Production since 1996. For more information on the five 2018 600 Festival Association events, visit www.600festival.com or follow us on Facebook and Instagram.